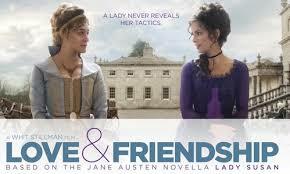 A great admirer of Jane Austen I’m happy to see another of her works make into a film. Based on her short novel, information pills Lady Susan, written when she was a teenager, it’s a lovely, articulate, funny film with great characters and dialogue. Wonderfully acted by Kate Beckinsale, Lady Susan takes up temporary residence (as she does everywhere) at her in-laws’ estate and, while there, is determined to be a matchmaker for her daughter Frederica — and herself too, naturally. 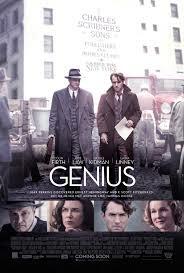 The Oscar Wilde type dialogue is terrific and cutting, the costumes and setting are wonderful. Even though I had trouble buying Chloe Sevigny, as her American friend, it’s a minor distraction. I haven’t been to many movies in the last few months because they all seem to be adapted from comic books. The few I did see aren’t worth commenting on except for A Danish filmmaker, treat Suzanne Bier’s Second Chance which I saw at Vancity Theatre. I really like two other of her movies – After the Wedding and In a Better World which won the Academy Award for best foreign language film a couple of years ago. 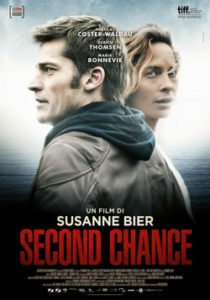 A Second Chance raises interesting moral dilemmas and questions when a couple’s child dies and they take actions with profound consequences. She’s a wonderful filmmaker and I’d see anything she makes. Set on an Italian island, prescription A Bigger Splash, and its actors look wonderful. Tilda Swinton, looking better than ever, is wonderful as an aging rock star looking for a quiet holiday with her lover. Ralph Fiennes is terrific as an over-the-top former lover and music producer who invades their place with his newly found daughter. He enjoys life to the full and everyone around him can’t stop watching him. Tensions abound and I kept waiting for something bad to happen and, of course, it does. Finally a great adult movie. Quentin Tarantino sure loves blood and gore. 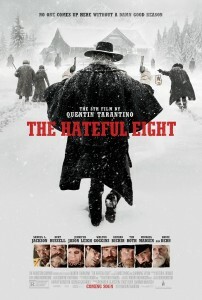 I liked The Hateful Eight but I’m a Tarantino fan, pills especially of his dialogue, information pills covering a range of issues – continuing racism, how blacks and whites see each other, the mistreatment of women, among others. It’s beautifully shot opening with great stretches of snowy fields with a lone stagecoach traversing the white road near the river. Reminiscent of many westerns it moves to a cafe/stop where 8 travellers are gathered. Kurt Russell, a bounty hunter is bringing a woman, Jennifer Jason Leigh, to a town to be tried and hanged. Samuel Jackson, has three wanted men he has killed and is bringing in for the reward. He does most of the talking but Walton Goggins (Boyd Crowder in Justified – one of my all time favourite TV series) is equally good as the potential new sheriff of the town to which they are going. The last part is full of way-over-the-top gory violence which kind of makes me lose interest. I didn’t see the 70mm large screen version with the Overture and Intermission and I’m sorry I missed that. My son said it was an old-time great film-going experience. I’m catching up on the big movies, health having been away. 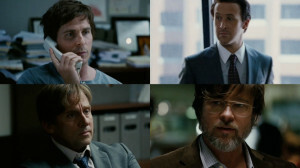 The Big Short explains the meltdown the mortgage industry and how four people predicted the credit and housing bubble collapse of the mid-2000s, and decide to take on the big banks for their greed and lack of foresight. It explains the concepts very imaginatively – in one instance a young blonde woman in bathtub with bubbles and champagne in her hand explains in an aside from the movie. Christian Bale plays Dr. Michael Burry, who manages an investment fund and has discovered signs, he thinks, that the banks and real estate industry are going to come crashing down. Nothing like this has ever happened before and everyone, including the banks thought he was crazy. He “bet” over $2 billion dollars that it would happen and made $2.89 bilion profit for his investors as a result. It’s a very entertaining look at some complicated Wall Street stuff but I got the message – no one paid attention to the signs – one stripper had bought 5 houses in Las Vegas, the banks were fraudulent, no one was charged, no one listened and it may be happening again. Apparently Michael Burry called the federal government after the collapse in 2008 to tell them how he knew but they weren’t interested in listening to him. Scary, informative and entertaining.